Homepage. This page: Interesting artwork on this headed letter from Joseph May removals. Shown below is a letter dating from 1928 that I bought recently. 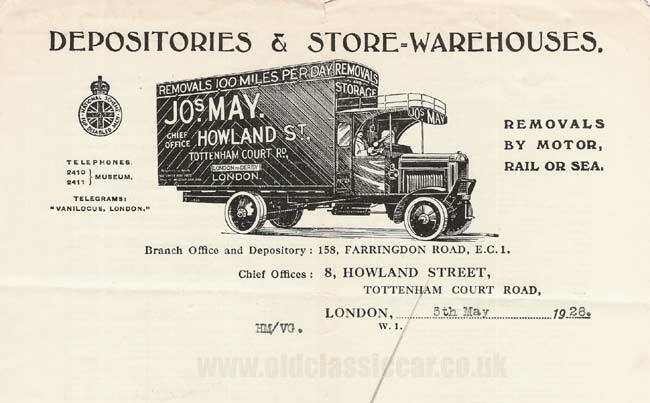 Featured at the top is a fabulous chain-driven lorry, in the livery of Joseph May - Depositories and Store-Warehouses. The lorry is a really early example of a vintage commercial vehicle. It may well have been an ex-military vehicle, from the WW1 era. Some interesting detail is included in the illustration - note the solid rubber tyres fitted to the solid wheels on this lorry, and the suggestion of chain-drive to the rear axle. Lighting was not a strong point of these early machines, you can make out a single lamp mounted on the offside scuttle area, below the open-sided cab. The hefty grille guard hanging off the front of the vehicle, just above the starting handle, also hints at a possible military use in an earlier existence. Just behind the driver is the legend "No.21", so it would seem like this particular removals & storage company had quite a fleet of lorries and vans operating from their Howland Street, Tottenham Court Road head office. This particular letter was written in May 1928, and addressed to a solicitor in Stroud, Gloucestershire, regarding the movement of some papers to Thrupp Cottage (is this cottage still around??). To the left of the lorry drawing is a small motif for the "National Scheme for Disabled Men". I assume this was an organisation to aid former servicemen who had been injured during the First World War to gain employment during peacetime. Whoever employed the services of Jos. 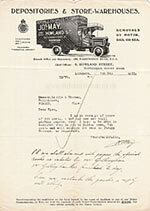 May could be re-assured that their goods, while in the lorry, were adequately covered ... "Notwithstanding the conditions on the back hereof, in the event of Accident to any of our Motor Pantechnicons, or Fire, we hold the contents of each Motor Pantechnicon insured for 500 pounds, but only whilst actually in the Motor Vehicle." Return to the Motoring Collectables section, where more items like this can be found. For example, a 1920s letterheading for the removals firm of A. Humpherson, featuring a motor lorry he used in the course of his business.